Your chicken coop can be either a night-time resting place for free range birds, or an all the time home for those that are confined. Whatever its purpose, your chicken coop has certain things that it needs to be the best coop possible for your birds. It should provide them with roosts, nesting boxes, and protection from both predators and the elements. Here are some tips for making your coop the best it can be. 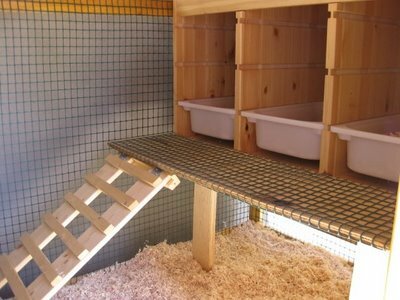 If your chickens are confined to their coop, you will want to make sure that they have 3-4 square feet of space each. So if you have 12 chickens, your coop will need to be at least 36 square feet. When chickens are forced to battle for room, it decreases egg production and increases the stress level. An increased stress level, as well as small spaces can also raise the level of disease vulnerability. Making sure your birds have enough room to wander is the best way to reduce this. Free range hens suffer from this a bit less because they often have a field or pasture to graze through and only return to their coop to lay and sleep. And remember, the bigger the chicken the more space they will need. Hens, especially laying hens, love to roost at night. Set your roost at least two feet off the ground and give six-ten inches of space per bird. We have our hens in a rabbit hutch that my father installed a bar for them to rest on while sleeping. Every night they hop right into the hutch and up on the bar. We shut the door and they’re safe and happy all night long. Laying hens need at least one square foot of laying space for every four to five hens. Keep an eye on your birds, however, the ladies may split off into laying pairs, and if this happens you will need to have at least two nesting boxes available so that they can lay together. Nesting boxes should also be about two feet off the ground and easy to get both in and out of for the birds. It is important that your birds, especially those that will remain confined, get enough fresh air, but not too much fresh air. It is a bit of a balancing act, especially as you will want to make sure they remain warm in the colder months. If your coop is in an area of high winds, consider moving it to a location that provides a little more shelter. And chicken houses in colder climates will need to be insulated to keep the birds warm in the winter. Placing waterers and feeders is slightly tricky. Chickens aren’t known for their brilliance and are dedicated to their routines. Keep waterers and feeders where you can easily reach and refill them, and where the chickens can find them as often as they need to. It is important that you avoid changing things or you may find your chickens standing where the water and food used to be, clucking hysterically as they wonder why you’re starving them to death! Give your coop lots of windows so that natural sunlight can help your hens get lots of Vitamin D. In cold winters, you will want to provide heat lamps that keep the coop warm but not too hot. Our heat lamps are on a temperature triggered timer. When it reaches a certain temperature the heat lamps flip on and keep the water in the waterers from freezing and our hens from getting frostbite. The most important function of your coop is protection from predators. You will need to make sure that it is secure, well locked and made in a way that even the most wily of animals won’t be able to sneak inside and cause your chickens trouble. Keep your coop off the ground and bury fencing about two feet underground around it. Our coop is on a cinderblock foundation as well. Cover your chicken run so that hawks cannot swoop down and consider electrical fencing. Everything else will all be for naught if a weasel or raccoon can break into your coop and help themselves to eggs or chicken while you aren’t looking.